The following extract is taken from the late Tom Porter’s book Annalong in the 1800s . The name ‘Annalong’ does not appear on any document prior to Symington’s Survey of 1655. In the Census Report of 1659 Annalong is referred to as a ‘quarter’- a sub-division of a townland – in this case Moneydarraghmore. Like practically every locality in Mourne, the name derives from the Irish Celtic (Gaelic) – Ath na Long. This means ‘the ford of the ships’- a reference to some crossing on the river near where it enters the harbour. It probably relates to Viking times of around a thousand years ago when the longships found some shelter at the mouth of the river. There is no material evidence of the Vikings ever having settled here. However, there are some words in the local dialect which would appear to suggest Norse influence. ‘Selk’ is the local name for the common seal; to ‘set allow’ is to set on fire; to ‘hain’ is to eke out; ‘holm’ refers to low-lying land close to the river. Until recently, fish were normally sold by count and the long (Norse) hundred of six score was used. The traditional method of counting fish meant that a ‘hundred’ actually contained 127 fish! The Vikings are also said to have introduced the clinker-built boat with the lower edge of each plank overlapping the one below, like the slates on a roof. This method of construction was favoured by local fishermen until recent times and is still used on occasions. Whilst the link with the Vikings may be tenuous, there is firmer evidence for much earlier human habitation. During the middle 1980s, when some minor excavation was being carried out during the making of the Marine Park at Annalong, 89 pieces of humanly-worked flint were turned up. There was insufficient evidence to date these artifacts but it is quite possible that they were between 6000 and 7000 years old and thus belong to the late Mesolithic period (middle Stone Age). 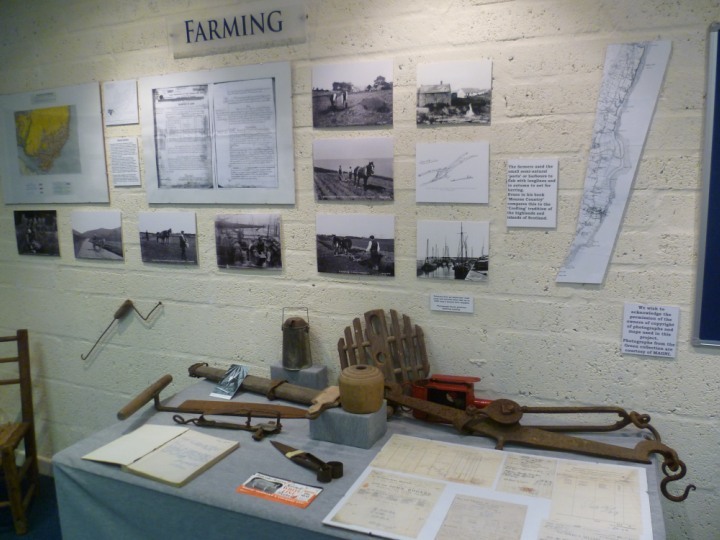 The Industrial Heritage of Annalong was on view at the Cornmill Quay in Annalong just a few years ago. The exhibition provided an insight into life in and around Annalong in bygone years and actually proves that Annalong was inhabited 6000-7500 years ago. There were many fascinating exhibits which were of interest to both the young and not so young. Please check out the gallery dedicated to this exhibition below. Check out our Places to Stay page to see available accomodation now!